KBB.com Brand Image Awards. This GMC Sierra SLE 2500 Double CA boasts a Gas/Ethanol V8 6.0L/366 engine powering this Automatic transmission. Remote keyless entry, WHEELS, 17 (43.2 CM) MACHINED ALUMINUM includes 17 x 7.5 (43.2 cm x 19.1 cm) steel spare wheel. Spare not included with (ZW9) pickup box delete unless a spare tire is ordered (STD), TRANSMISSION, 6-SPEED AUTOMATIC, HEAVY-DUTY electronically controlled with overdrive and tow/haul mode. Includes Cruise Grade Braking and Powertrain Grade Braking (STD). * This GMC Sierra SLE 2500 Double CA Features the Following Options *TRAILER BRAKE CONTROLLER, INTEGRATED, SUMMIT WHITE, SLE PREFERRED EQUIPMENT GROUP includes standard equipment, JET BLACK, CLOTH SEAT TRIM, GVWR, 9500 LBS. (4309 KG), ENGINE, VORTEC 6.0L VARIABLE VALVE TIMING V8 SFI, E85-COMPATIBLE, FLEXFUEL capable of running on unleaded or up to 85% ethanol (360 hp [268.4 kW] @ 5400 rpm, 380 lb-ft of torque [515.0 N-m] @ 4200 rpm) with (E63) fleetside pickup box; (322 hp [240.1 kW] @ 4400 rpm, 380 lb-ft of torque [515.0 N-m] @ 4200 rpm) with (ZW9) pickup box delete (STD), AUDIO SYSTEM, 8 DIAGONAL COLOUR TOUCH SCREEN WITH INTELLILINK, AM/FM/SIRIUSXM with USB ports, auxiliary jack, SD card slot, Bluetooth streaming audio for music and most phones, hands-free smartphone integration and voice-activated technology for radio and phone (STD), Windows, power with driver express up and down and express down on all other windows, Wheels, 17 x 7.5 (43.2 cm x 19.1 cm) full-size, steel spare. Spare not included with (ZW9) pickup box delete unless a spare tire is ordered. (Requires 17 wheels and tires. ), Wheelhouse liners, rear (single rear wheel only). 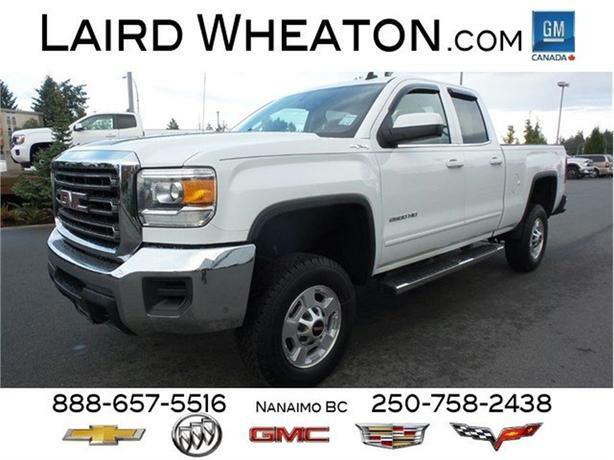 * Visit Us Today *For a must-own GMC Sierra SLE 2500 Double CA come see us at Laird Wheaton, 2590 Bowen Road, Nanaimo, BC V9T 3L3. Just minutes away!